The re-roof or roof repair question can depend on many factors. How old is your roof? The age may be unknown. 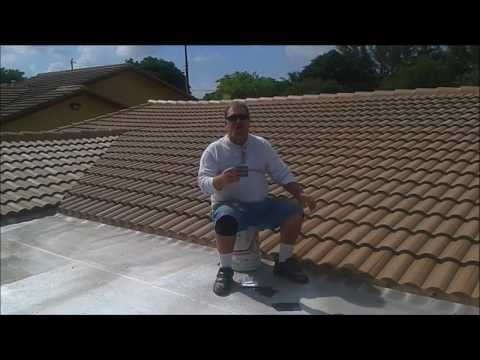 We perform a thorough roof inspection to determine how much useful life it has left. Are there leaks? Leaks in the flashings of detail areas such as chimneys, skylights, valleys and walls are usually due to workmanship defect and can be repaired. Leaks due to material failure indicate the roof is deteriorating and repairs are less practical. The time an owner plans to stay in their home and budget also factor into the decision. Miami roofing systems face constant pressure from the elements. Proper roof cleaning and maintenance is essential to ensure that homeowners receive full value for their investment. The residential roofing applications used in South Florida present different maintenance challenges to homeowners and roofing contractors. A clean roof adds to a home's curb appeal, reduces cooling costs and extends the life of the tile underlayment. Traditional pressure washing with bleach damages roof tile and must be repeated almost yearly to remove re-growth of algae and mold. Roofer Mike Inc features an eco-friendly roof cleaning and sealing system that not only maintains the finish of the tile but lasts much longer. The sealing process works with the sun's ultra violet light to prevent algae re-growth. Our roof cleaning and sealing system also works great on driveways, patios, sidewalks and brick pavers. Roofer Mike also offers a 3-year workmanship warranty. I contacted Mike because I had a leak near my chimney. When he showed up and in no time he came up with the exact diagnostic for the problem. The construction around the chimney was below par. It needed a cricket(something that sits behind the chimney). He was able to give me an a firm estimate for the complete roofing around the chimney. He finished the job on time, hassle free and the roof hasn't leak since then. Hired Roofer Mike after getting several quotes from other companies. Just got a gut feeling that when we met with him, he was honest, sincere and put everything upfront. Our wasn't the easiest to fix but he did an outstanding job. Glad we chose him cause at the end I think his craftsmanship was superior to the others. Roofer Mike Inc. did an excellent job on replacing the worn out tile roof with a new shingle roof on my grandmother Miami Springs home. They cleared off, replaced and repaired a good portion of the deteriorated wood decking and framing on the roof along with making improvements on the eves. I highly recommend them for any roofing repairs or replacement. Mike did a great job with our roof, replacing barrel tile with metal. Looks great and has withstood several rainstorms and a severe windstorm. We're happy. Roofer Mike just finished a nasty roof repair on my home. The original installer looked at the job and never came back. Mike gave me an estimate and attacked the job. It got worse as he went, but he didn't hesitate. He matched the old (20 year) tiles to a point where you don't notice the repairs and he accomplished all that he promised within his estimate. He is a first class tradesman. Roofer Mike fixed a complex leak where another had failed three times; later did a super cleaning ... in both cases with clear expertise, courtesy, good humor and a fair price. If all businesses were like this, our problems would be over. View next listing Design Roofing Corp.